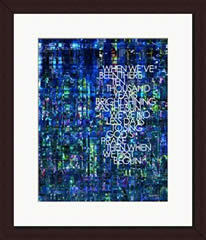 the “amazing grace!” series features a multi-faceted, abstract stained-glass backdrop with foreground typography portraying the simplicity and timelessness of this hymn's redemptive message. Hymnscript open edition fine art prints are produced and sold by Imagekind. Imagekind guarantees the quality of its products and your satisfaction is 100% guaranteed. If for any reason you are not satisfied with your purchase, you may return it to Imagekind within 30 days of receipt for a full refund on the price of the item. If your item arrives damaged, Imagekind will ship you a replacement at no additional cost. 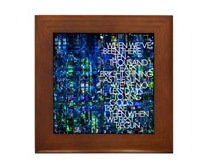 Imagekind holds a non-exclusive license to produce open edition digital fine art prints (giclees) of Hymnscript artwork from Diana Wolverton Studio. 6" x 6" x 0.5"
Amazing grace!-how sweet the sound-that saved a wretch like me! how precious did that grace appear the hour I first believed! ’tis grace has brought me safe thus far, and grace will lead me home. we’ve no less days to sing God’s praise than when we’ve first begun.